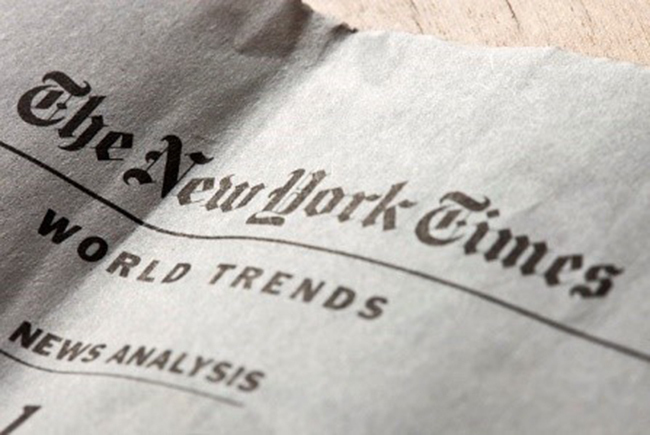 Justin’s note: If you haven’t heard yet, Strategic Investor editor E.B. Tucker’s working on a new venture. He plans to share all the details about this product at the end of this month. Leading up to that big announcement, we’re featuring his best insights and money-making opportunities. The renter trend – E.B. sold his largest stock at the peak in 2008. That gave him the “dry powder” to buy six rental properties. A decade later, he still has a passive income stream that yields around 20% per year. The blockchain wave – E.B. was able to exploit this massive trend and made 15,000% in profits on a blockchain mining deal. The Bitcoin bubble – On December 14, 2017, E.B. pleaded with his readers who owned bitcoin to sell enough of their coins to recoup their initial investment. That was four days before bitcoin reached its all-time high of $19,783. Folks thought he was crazy. Bitcoin’s at $3,370 today. In short, it pays to listen to E.B… especially when he’s pounding the table on a big idea. And that’s what today’s essay is all about. A society is only as strong as its access to supplies of reliable energy. While the source of that energy changes over time, one thing doesn’t: Controlling the supply of that energy is as close to printing money as you’ll ever get. Throughout time, the richest barons in history sold society its energy. Last century, oil fueled society. Barons like Jean Paul Getty made so much money supplying society with oil, the wealth became a burden. From the Rockefellers to the Saudi royals, the story is the same. Controlling the supply of energy is equivalent to a levy on the entire economy. Before oil, it was coal. Coal created scores of 19th-century fortunes. Even Andrew Mellon, who later became Secretary of the Treasury and the third-largest taxpayer in the 1920s (behind Rockefeller and Ford), got his start in the coal business. The same trend stretches all the way back to medieval days, when wood provided heat, a cooking flame, and lit rooms. The lords who owned the forest set the price for warmth, hot food, and light. Today, we’re on the dawn of a new era in energy. 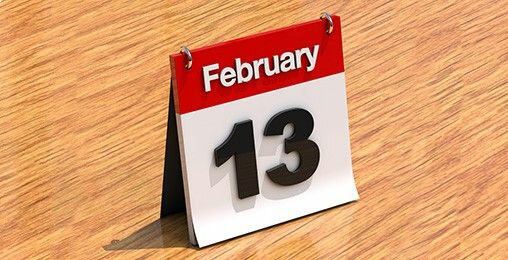 Some of the most famous stock market bulls in the world are preparing for a massive event in February. Last century was the oil era. From Ibn Saud, Rockefeller, Getty, and even shale oil tycoons like billionaire Harold Hamm of Continental Resources, the oil business created trillions of dollars’ worth of wealth. Now, I’m not saying major oil companies are down for the count… they’re not. I’m also not saying billionaires like the Saudi royals are in trouble… they’re not. What I’m saying is that over the decades to come, those families, those billionaires, and those major companies we know today will not see their fortunes swell. They’ll chug along. They’ll also be surprised as new energy barons leap past them on the Forbes list. You see, oil goes in about every product we use today. From the tube of toothpaste to the lid on a Starbucks cup, it’s hard to get away from oil. 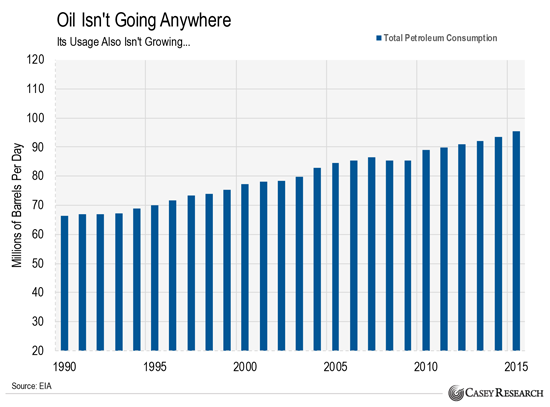 This chart shows how much petroleum the world uses on a daily basis. I’m sure the first thing you think when you see this chart is that the oil business must be great. It is for the most entrenched players. Oftentimes, this means governments. After all, as much as 75% of the world’s oil production comes from state-owned oil companies, according to The Wall Street Journal. What I hope you’ll see is that the oil business isn’t getting much better. For starters, climate change warriors are out to attack the business at any chance they can get. 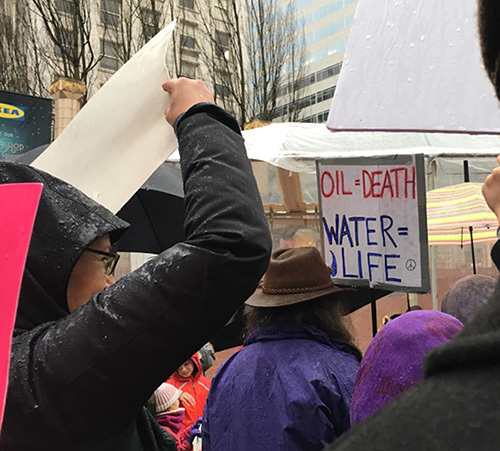 I attended a raucous anti-oil protest in Portland, Oregon back in 2016 for research purposes. Then, take taxes into consideration. Every gallon of gasoline sold in the U.S. has a $0.184 federal levy placed on it… and some states, like Pennsylvania (the highest case), pile on as much as $0.582 per gallon on top of that. States need that money to fund their bloated budgets. Oil is under attack from every angle. Meanwhile, alternative power gets the opposite treatment. In some states, you can actually make money driving an electric car or bolting solar panels onto your home. Just to be clear, we don’t have an opinion about which energy source is better. In my newsletter Strategic Investor, we separate our ideology from our investing. With this in mind, we see the oil trade as old, tired, and predictably stale. We see alternative energy as inevitable. I know that’s hard to believe… But this is 100% based on actual reports from people just like you. 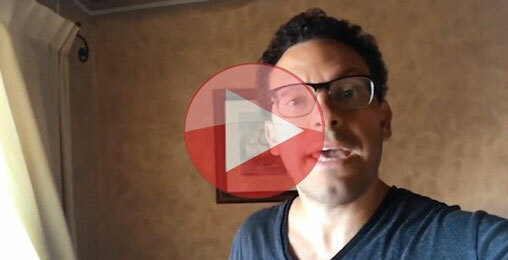 Just see for yourself… watch this 1-minute clip before Friday at 3pm. Learn how readers like Steve from Michigan made $7,500 just the other weekend. But hurry! This only works if you take one simple action before Friday at 3pm. Electric vehicles will be cheaper than those with combustion engines. Estimates say that 4.5 million new electric vehicles will be sold every year in China alone by 2020. Solar and wind power will be even cheaper and – more importantly – be available on-demand, 24/7 (think streaming), thanks to the energy storage capabilities of high-tech batteries. This will lead to the rise of micro-grids and independent home energy. You see, new battery technology is cutting costs in half… while increasing storage capacity. And that’s why the mass production and adoption of the electric car is no longer a pipe dream. It’s a reality. Oil’s 1.5% annual demand growth over the last two decades is nothing compared to surging demand for battery capacity. The chart above measures battery demand in gigawatt hours (GWh). To put things into perspective, in 2016, all consumer products with lithium-ion batteries added up to 45 GWh, according to The Economist. That means every cordless drill, smartphone, and even e-cigarette combined. Electric car batteries produced that year added another 25 GWh. 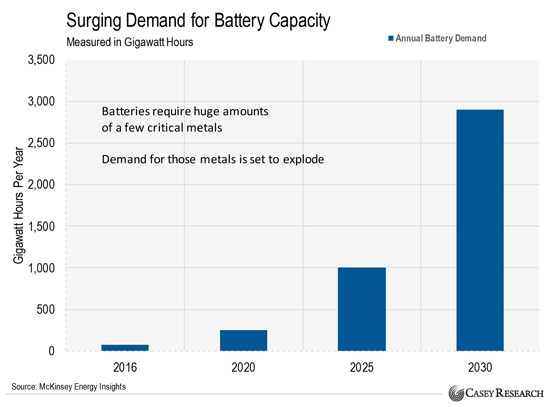 By 2030, management consulting firm McKinsey & Company expects demand for battery capacity to surge more than 36-fold to 2,900 GWh per year. And that, in turn, will create a massive spike in demand for a handful of new energy metals required to make all these batteries. There’s no comparison. New energy sources will leap over oil’s tepid growth in the coming years. With clean energy economic incentives in place, no protesters, and technology on its side, a new energy source is set to power the future. In short, the biggest power shift in the last 100 years is happening now. And it’s creating a tipping point in the next generation of energy metals. If you know where to put your money ahead of time, you could see once-in-a-lifetime gains. We’re set up to profit from this megatrend in my Strategic Investor newsletter… and you can join. Are you bullish on new energy sources? How about the metals that will profit? Let us know at [email protected]. Profiting from America’s third power shift is just one of the many big ideas E.B. has to help you make a fortune in today’s markets. E.B. and Doug are ready to share the details on this strategy later this month in what’s sure to be one of the most important events in Casey Research’s history. We’ll let you know more details over the coming weeks.